Begins with a children’s story about a baby’s baptism day-told from the baby’s perspective! Includes short essays that explain the sacrament of Baptism. The book becomes a keepsake for this very special day allowing parents, godparents, and others to describe the day. This book carries the imprimatur of the Catholic Church. Price: $19.95 hardback gift edition – Now with an additional 20 pages at the same low price! A children’s read-to-me story about a baby’s baptism day. The story is written from the perspective of the baby watching the goings-on of the day. 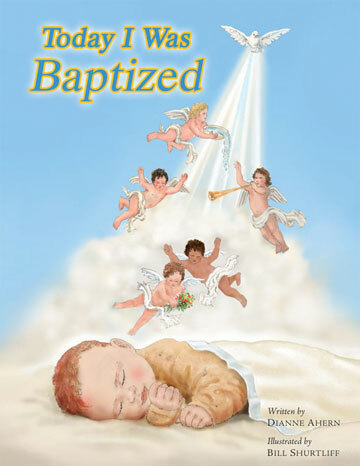 The story helps children to understand the Sacrament of Baptism and is especially helpful to prepare siblings for the Baptism of their new brother or sister. Six short essays explain the significance and traditions associated with Baptism. The essays are nice “refreshers” for Christians who might not have thought about Baptism for a while, and are helpful to explain Baptism to individuals who have not received formal religious education. 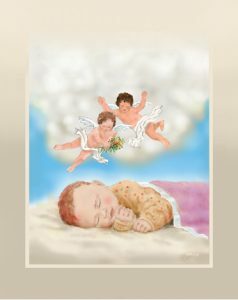 It becomes a keepsake book with pages for parents and godparents to write their own special message to the baby, include photos of the day, insert a copy of the baptism certificate, and more. Today I Was Baptizedmakes the perfect gift and keepsake to commemorate this special day. In 1999 Dianne Ahern was leading a very successful life. She had a master’s degree in healthcare administration and was vice president of Elan Systems, an international healthcare consulting firm. But, she says, that just wasn’t enough. That moment of inspiration has not taken long to materialize. Ahern presented the idea to here partners at Elan Systems, who thought that it would open new opportunities for the company. Elan already published findings and recommendations in print and graphic format for their clients, so a new division of the company was formed called Aunt Dee’s Attic. By June 2000, Aunt Dee’s Attic had published Ahern’s first book, ‘Today I Was Baptized’. The illustrations, done by Katherine Larson, depict Ahern’s parish of St. Thomas the Apostle as well as the pastor, Fr. Roger Prokop. Now, Ahern has completed her second book, ‘Today We Became Engaged’. ‘Today We Became Engaged’ offers helpful hints for things such as the ring, the proposal and acceptance. It also has an entire section for the couple to record their story: how they met, their courtship, the engagement story, and possibilities for the future. TODAY I WAS BAPTIZED, Revised Edition, tells the story of a baby’s Christian baptism from the infant’s perspective, a surprise twist. 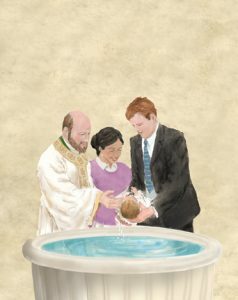 Following the beautifully told and illustrated story are six short essays on the Sacrament of Baptism, including Why We Baptize, Why and How We Use Water In Baptism, The Baptism of Jesus Christ, How Jesus Conferred the Right to Baptize to the Apostles, Anointing with Oil, and The Baptismal Gown. There are also designated pages and spaces at the end of the book for My Baptism Memories, for TODAY I WAS BAPTIZED is a keepsake book, with room for messages, photographs, and souvenirs of the baptism. TODAY I WAS BAPTIZED carries the imprimatur and rescript of the Catholic Church. The book would make a lovely gift to a Christian family with a baby. Dianne Ahern grew up on a farm in Illinois, has traveled extensively for business and pleasure, and now resides in Ann Arbor, Michigan. She holds a Bachelor’s degree in Biology and Medical Technology from Marian College (University), and a Master’s degree in Healthcare Administration from Indiana University. After rewarding careers in laboratory medicine, hospital administration, and healthcare consulting, Dianne found a new love: researching and writing about the events that shape our lives. It was after her first Vatican visit in 1999, when Dianne looked into the eyes of Pope (Saint) John Paul II, held his hand, and kissed his ring, that she felt called to write books for Catholic children and their families. Already a successful businesswoman, Dianne formed her own publishing company, Aunt Dee’s Attic, to support her new calling. 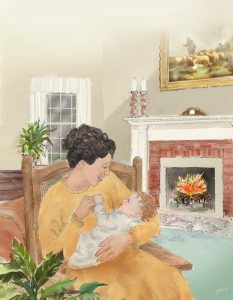 Beginning with the sacrament of baptism, Dianne outlined a series of books on the sacraments designed to prepare families for these most important events. Her books’ formats merge storybook, reference book, and memory book elements into beautiful keepsake books. The sacrament books feature the imprimatur of the Catholic Church to assure families that the contents are true Church teachings. In addition to her books on the sacraments, Dianne has developed a series of adventure/mystery books for young readers subtitled Adventures with Sister Philomena, Special Agent to the Pope. The Adventure books place fictional characters in real settings to teach about the Church, saints, and holy places. 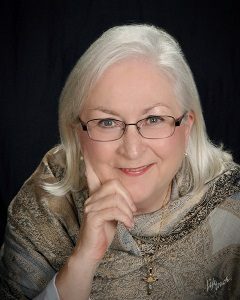 Her books have won accolades from retailers, readers, clergy, teachers, grandparents, and moms and dads. 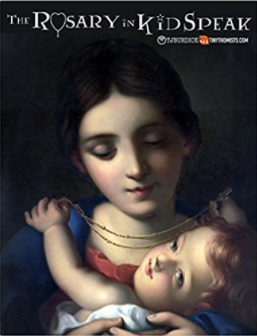 This book was designed to help families pray the rosary with their children. Each mystery includes a piece of sacred art, a description of each mystery in “kid speak”, and instructions on how to pray this treasured method of prayer given to us by Our Lady herself. The digital version of this book can be downloaded for free at tinythomists.com. It comes as special gift we give to all of our members who enjoy bi-weekly faith formation plans grounded in the philosophy and theology of St. Thomas Aquinas. Each lesson includes a portion of the Summa Theologica in simplified kid speak, Lectio Divina, Saintly Situations, a Read to Me explanation of the Catholic faith, fun activities to do with your family and much more. Want to sign up for a subscription to Tiny Thomists? Join here! St. Louis De Montfort tells us in his timeless book on Our Lady, True Devotion, that “the safest, easiest, shortest and most perfect way of approaching Jesus is through Mary.” The Rosary is the tool that Mary gave to St. Dominic to help us grow in our relationship with her, to recognize her mysterious role in the story of salvation. In the same way that Jesus came to us through Mary, so do we come to him through her divine intervention as the Mother of all Christians and the Queen of Heaven and Earth. It is through her Rosary that we are tied to God’s grace and as faithful benefactors of such blessings, we are better equipped to carry out the personal missions God gives us to complete. This book was written to help parents complete their mission of raising Christ-like children by helping them come to know, love, and serve Jesus through the love of his Mother. The Rosary, then, becomes the lifeline that unites us with the Holy Family, engaging our hearts and minds with the mysteries that each decade represents. The first is an image of the mystery taken from sacred art over the past two millennia. These serve as a focal point to ignite our imagination and place ourselves in the scene of each mystery. The second component is a description of each mystery in child-like simplicity. The words were chosen deliberately to identify with children 10 years old and younger so that they can comprehend the basic fruits of each mystery. This will serve as a solid foundation for their faith. As they grow in strength and wisdom, they can be exposed to the sacred scriptures when they are mature enough to understand them. The Rosary has been called the “epitome of the whole Gospel” (CCC 971) and as such, it teaches children the greatest story ever told. It is recommended that the Rosary be prayed together with your children at a determined time each day so that the seeds of the Rosary can be planted, tilled, watered, and nourished through the repetition, contemplation, and imitation of the virtues it promotes. T.J. Burdick the author of several books and professional speaker. He is the founder of the Dominican Institute and blogger at tjburdick.com. 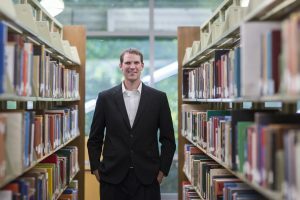 A former missionary to Latin America, T.J. creates media on how to grow in holiness amongst the distractions and difficulties of the current age. All proceeds from this book go to help fund Catholic missions. He resides in Grand Rapids, MI, with his wife and four children. Fr. 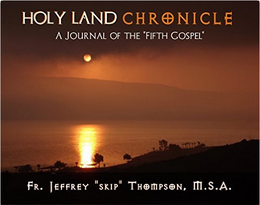 Thompson has developed an excellent photo-documentary that will serve as a helpful guide for anyone traveling on tour to the Holy Lands or remaining at home and living vicariously through the camera lens of one who has done so already. From the walls of Jericho to the tomb of Christ, Fr. Thompson’s eye captures it all, providing a rich narrative of explanation along the way. – Dr. Sebastian Mahfood, OP, co-author with Dr. Ronda Chervin of Catholic Realism. Fr. Jeffrey “Skip” Thompson, MSA, is the Dean of Seminarians at Holy Apostles College & Seminary. 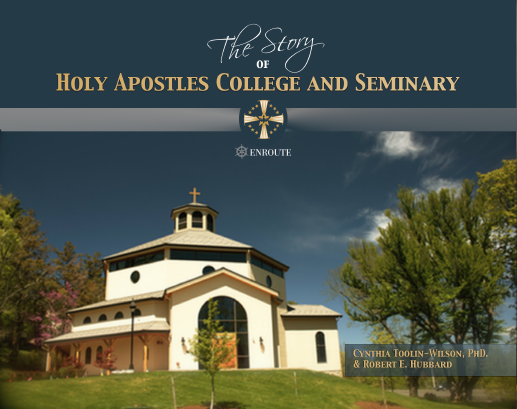 The Story of Holy Apostles College and Seminary is a yearbook of over sixty years of a Catholic seminary and college located in picturesque Cromwell, Connecticut. Dr. Toolin-Wilson and Prof. Hubbard begin with a brief overview of the first years of Holy Apostles, including its founder, Fr. Eusebe Menard, OFM. They next use words and pictures to describe the vibrant Holy Apostles community. This community is guided by bishops, rectors, faculty, and staff whose concern is the development of Catholic ordained, religious, and lay faithful leaders. The authors emphasize the stability of Holy Apostles in its mission of forming Catholic leaders. They document its development from a small school with fewer than ten students to an institution serving a diverse student body composed of many ethnic and national groups globally through its online programs and residentially on its home campus. Among these groups are vocations to the priesthood, candidates to the permanent diaconate, religious sisters and brothers, and the laity. Almost 300 full-color photographic pages available to ship by December 20, 2018, for $89.99. Pre-order here at a 20% discount. Offer ends on January 1, 2019. Only $71.99 plus shipping! Listen to "Ronda Chervin interviews Cynthia Toolin-Wilson, Co-Author of The Story of Holy Apostles (December 13, 2018)" on Spreaker. Listen to "wcat_radio_i_thought_youd_like_to_know_with_cynthia_toolin-wilson_and_bob_hubbard_3.20.17" on Spreaker. Cynthia Toolin-Wilson is a Professor of Dogmatic and Moral Theology at Holy Apostles College and Seminary. She holds a doctorate in sociology from the University of Massachusetts at Amherst, and a licentiate in theology from Dominican House of Studies in Washington, D.C. She teaches graduate courses on campus and through online learning. She is a wife, mother, grandmother, and great-grandmother. She divides her time between Connecticut and Vermont. 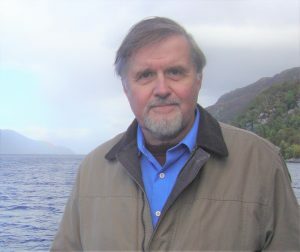 Robert Hubbard, a retired professor at Albertus Magnus College, is the author of seven books including The Last Survivors, Legendary Locals of Middletown, and Connecticut’s Deadliest Tornadoes. He is also the webmaster of biographical websites on St. Thomas More, and entertainers Nana Mouskouri and Phil Silvers. 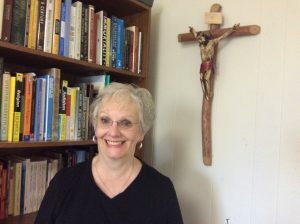 A lifelong Catholic, he was impressed by Holy Apostles College and Seminary’s goal of “forming moral and ethical leaders who know and love God,” and asked Cynthia Toolin-Wilson to collaborate on a book that would tell the Holy Apostles story. A sign for the evangelizer’s door, the last thing he or she will see on his or her way out into the world. Prices vary depending upon the size of the sign and kind of material on which you choose for it to be printed. Options through the link below. Whenever we leave our houses and enter the world, we’re entering mission territory. We are entering, in short, a secular culture that is highly materialistic and highly egotistic. And what are we going to encounter when we get there, which is just a step outside our front door? We’re going to encounter people who live by their appetites, who lust, excessively consume, greedily waste and horde money, and anger easily. We’re going to encounter unbelievers, and we’re going to encounter believers who do not practice their faith. We will encounter these and many more, and we are going to find that our efforts to live a faith-based life may falter in the wake of them. How do we remind ourselves to be prepared for the world and the persons we’ll encounter within it? With our new door sign, of course, reminding us that when we step out our front door, we’re entering mission territory. 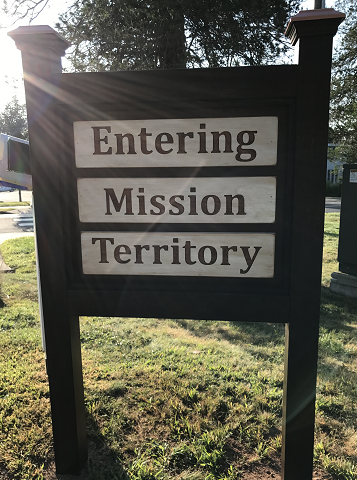 Inspired by the “Entering Mission Territory” sign at the bottom of the driveway at Holy Apostles College & Seminary in Cromwell, CT. We all need this kind of reminder whenever we leave our sanctuary!